Amazon Cloud Drive is yet another way that users can upload and store information in the cloud. Much like other cloud storage options, an Amazon Could Drive can be used for a variety of purposes, including those a bit more nefarious such as intellectual property theft. It’s important that an examiner know what artifacts are left behind when an Amazon Cloud Drive is utilized in order to better explain what actions may have taken place surrounding a user and his or her Cloud Drive. At the time of this writing, I’m unaware of any commercial forensic tool that interprets/parses Amazon Cloud Drive artifacts. This post (as well as the next) sets out to highlight some of the forensic artifacts available to an examiner after a user transfers files to and from an Amazon Cloud Drive. Depending on the method used to interact with the Cloud Drive, artifacts will be left in different locations of the associated file system. At the time of my research, the Amazon Cloud Drive mobile app had not been released so I currently do not have details of the artifacts found on mobile devices. This post will cover the the artifacts left as a result of the Windows desktop application being utilized for Amazon Cloud Drive file transfers. In Part Two of this series, I will cover the artifacts available to an examiner as a result of the user accessing his or her Cloud Drive using only a web browser. The Amazon Cloud Drive desktop application is a small app that can be installed on a Windows or Macintosh system that helps streamline operations carried out on an Amazon Cloud Drive. Once installed, the user will be prompted to enter his or her credentials to access their Cloud Drive. After the credentials have been verified and the desktop app is running, the user may drag and drop files either to a small window associated with the app (see screenshot below) or the app’s icon in the taskbar to initiate an upload. One aspect of an Amazon Cloud Drive that sets it apart from some of the other cloud storage solutions is that there is no “magic folder” or directory within the file system that is set to automatically sync with the Cloud Drive. Instead, a user must selectively choose which files and folders he or she would like to upload or download from their Cloud Drive. Because of this, an examiner is not able to focus in on a single directory as the source of uploads/downloads on the local system. Luckily, the app has left us with a log file that is very helpful during forensic examinations. Since this file is in plain text, it’s possible to simply open the file in a text editor and analyze each record line by line or perhaps search for file names of interest within the file. However, if there was much activity with the Cloud Drive and this log expanded to hundreds or thousands of records, manual analysis would become quite cumbersome. After manually analyzing a few records from an ADriveNativeClientService.log file, the benefit of a script to parse this file is obvious. To carry out such automation, I’ve written a Perl script that parses the records within an ADriveNativeClientService.log file and outputs the result in CSV format for easy viewing within a spreadsheet application. The Perl script for parsing this log file simply accepts the path to the log file (or a directory of log files specified with the “-d” flag) and outputs the result in CSV format. By using this script, you can translate records similar to the one above into a much more readable format as in the screenshot below. The script is freely available for download here. This is a SQLite database stored in the same directory as ADriveNativeClientService.log that holds the queue of files to be transferred to or from a Cloud Drive. When many files are requested to be uploaded or downloaded at once, a queue will be formed and tasks (one task per file) will be assigned a status of “PENDING”. When a transfer tasks’s status is “PENDING”, information about the transfer (local path, cloud path, file size) is written to a record within this database. Additionally, if a transfer is paused while there are still files in the queue, the transfer tasks in the queue will be assigned a status of “PAUSED” and will remain in this database. If network connectivity is lost while a large transfer is taking place, this database allows the transfer to continue when connectivity is regained by supplying the list of files waiting to be transferred to either the local machine or the Amazon Cloud Drive. When the file transfer is complete, the associated database record is removed and information about the individual transfer is logged to ADriveNativeClientService.log. As I have not found this database to contain any active records relating to completed file transfers (i.e. where the transfer status is “COMPLETE”), the ADriveNativeClientService.log file appears to contain more useful information regarding completed file transfers. The information within this SQLite database may be relevant, however, to aid in demonstrating a user’s intent to transfer the files described in the database records to his or her Cloud Drive. 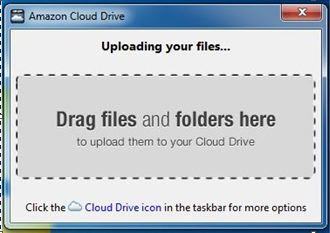 The Amazon Cloud Drive desktop application is easy to use and streamlines the process of file transfers to and from an Amazon Cloud Drive. This method of transfer may be desirable for many users, but for those that do not want to install an application on their workstation, the online interface provides a means of transferring files that requires nothing more than a web browser (and network connectivity of course). The forensic artifacts left behind as a result of file transfers to and from an Amazon Cloud Drive using only a web browser will be discussed in Part Two of this series.